When a Governor of a central bank speaks like a Governor, he is sure to receive two types of response. His candid speech will build private citizens’ confidence in central bank actions which in turn helps the Government in power to attain its growth objectives. But it could also anger his political masters if they are just concerned with short-term political gains and not about long-term sustainable economic achievements. 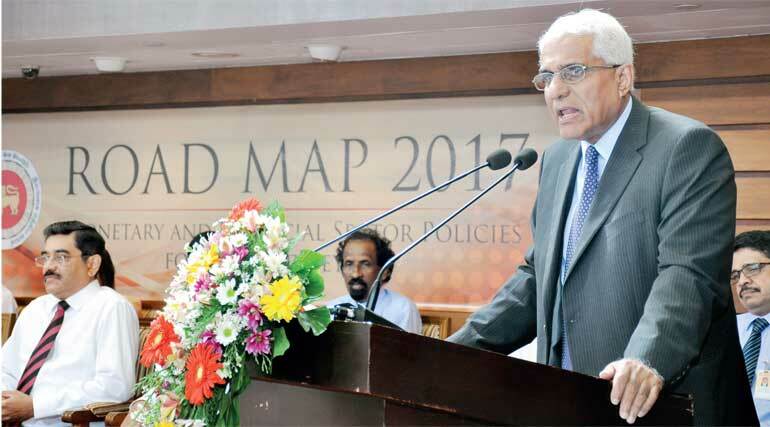 This is exactly what has happened to the Central Bank Governor Indrajit Coomaraswamy who had spoken as the Governor of the Central Bank and not as a politician at the launch of the Central Bank’s Road Map for 2017 a few days ago (excerpts of the Road Map available at: http://www.ft.lk/article/589325/Road-Map:-Monetary-and-financial-sector-policies-for-2017-and-beyond ). He was praised by the private sector immediately as demonstrated by the supportive press statement issued by the country’s leading business chamber, the Ceylon Chamber of Commerce or CCC. Suspecting moves by the political authority of the day to interfere with the free decision-making process at the Central Bank, it has called the business community to support the Bank’s independence (available at: http://www.ft.lk/article/589805/Ceylon-Chamber-calls-on-biz-community-to-support-CBSL-independence ). But Finance Minister Ravi Karunanayake is reported to have expressed his anger at a subsequent media conference at certain insinuations made by Governor Coomaraswamy during his speech (available at: http://www.dailymirror.lk/article/Ravi-calls-CB-Governor-a-hospital-attendant-121750.html ). Governor Coomaraswamy’s speech in question (available at: https://www.youtube.com/watch?v=tkJ2soMoO8w ) was candid, objective and impassioned unlike the speeches made by his two immediate predecessors. It did not contain political camouflage, painting a rosy picture about the soundness of Sri Lanka’s economy. He said that Sri Lanka’s economy was sick, in the hospital but fortunately not in the intensive care unit or ICU. He did not blame only the present Government for the malady, but made a general remark that it was all the previous governments that had caused the economy to be hospitalised. Consequently, the pressure for the exchange rate to depreciate cannot be prevented only through traditional monetary policy. The culprit is, therefore, the unsustainable budget deficits which the governments of the past have been religiously following, sacrificing the long-term sustainable development for short-term political expedience. He thus emphasised that economic reforms are necessary but they should be consistent, guided by commitment and focussed on clear outcomes. What he meant by this is that reforms should not be selective, abandoned midway and done half-heartedly. The cause for the pressure for prices to go up and exchange rate to depreciate had been the large fiscal deficits maintained by all successive governments since independence. The end of the civil conflict, according to Coomaraswamy, has created the best ground conditions for Sri Lanka to move on to a higher growth path. The responsibility of the Central Bank in this context has been to create facilitating conditions for both the private sector and the government sector to seize opportunities and elevate the economy to a high growth path. The country’s sick economy cannot be cured overnight, according to him, and it requires everyone concerned – citizens, politicians and bureaucrats – to take pains. There must be consensus among politicians and all other stakeholders about the need for cohesive reforms aiming at improving productivity, competitiveness and the business environment. He expressed the wish that when the Government would restructure the Central Bank it would give more powers to the Monetary Board implying that it should give a greater independence to the Bank. According to Coomaraswamy, such moves “would enhance the credibility of the central bank, while preserving the independence it needs to play its roles efficiently”. Has Governor Coomaraswamy said anything that should anger Finance Minister Karunanayake? No, because the Minister himself has admitted in the past in his budget speeches as well as in public forums that there is an urgent need for consolidating the budget. One example is the keynote address delivered by him at the Economic Summit organised by the Ceylon Chamber of Commerce in July 2016 in Colombo. He reaffirmed his commitment to consolidate the Budget meaning a number of reform measures being planned by the Government to discipline the budget that has gone astray. Those measures include increasing the revenue, reforming the tax structure, generating a surplus in the current account of the budget now known as the revenue account, reducing the budget deficit progressively and putting a check on the unsustainable growth in public debt. This summit, attended by President Maithripala Sirisena too, was addressed by Governor Coomaraswamy also on the same line. Hence, this writer, who was a panellist at the forum, praised both the Finance Minister and the Governor for speaking the same language but warned that what is being done by the Minister of Finance should not go against what the Central Bank is doing. For instance, if the Central Bank has adopted a tight monetary policy measure to prevent the economy from getting overheated and thereby exploding eventually by way of continuously rising prices, the Minister of Finance should not loosen his budgetary expenditure programs by giving extra money to the hands of people. It would result in an unwelcome consequence in which the Central Bank would be forced to further tighten monetary policy to arrest the situation. The ultimate result will be that the country would get trapped in a vicious circle of ever increasing interest rates (available at: https://www.youtube.com/watch?v=VDTDhPY2xv4&t=4s ). It, therefore, appears that the cause for the dispute has been that the Minister wishes to control the Central Bank just like another department of the Treasury and the Monetary Board led by Governor Coomaraswamy has resisted that move. This is not a salutary development since both the Minister of Finance and the Central Bank should work together by coordinating the actions which they plan to implement. The Minister should appreciate that an independent central bank serves the Government better in its present drive for joining the rich country club within a single generation, the avowed goal of the present as well as the past governments. Even a diehard socialist like Dr. N.M. Perera recognised this need when he was the Finance Minister during 1970-75. Addressing senior central bank officers in 1971, NM is reported to have said that the central bank should submit its reports without political colours and he would appreciate them only if they were dispassionate and objective. It would certainly behove the Government led by a liberal like Prime Minister Ranil Wickremesinghe to appreciate the wisdom so expressed by this socialist Finance Minister. However, the developments that have taken place since 2005 have been to the contrary. The previous administration led by President Mahinda Rajapaksa had compromised the Central Bank’s independence continuously prompting the critics like Dr. Harsha de Silva, an independent economist at that time and a Deputy Minister in the present Government, to blast the Government and the central bank management. Hence, when the new good governance Government was formed in 2015, all the expectations were that it would respect the central bank’s independence. In fact, the first economic policy statement delivered by Prime Minister Ranil Wickremesinghe in Parliament in November 2015 promised this. But the subsequent actions of his Finance Minister were to the contrary as highlighted by this writer in three previous articles in this series. In the first article published in August 2016 under the title ‘Be Warned! Monetary Board is losing its power as well as its independence’ (available at: http://www.ft.lk/article/562766/Be-warned--Monetary-Board-is-losing-its-powers-as-well-as-its-independence ), this writer drew the attention of the Government to two unsavoury measures which the Minister of Finance had proposed which fell within the legitimate scope of the Central Bank. One was the move by the Minister to introduce a national payments gateway outside the Central Bank; the other was a proposal to form an advisory group within the Ministry of Finance to address the solvency issues of banking institutions. Both these functions have been handed to the Central Bank by Parliament for valid reasons and the Minister of Finance cannot encroach into them at his discretion. The second article published in November 2016 reviewed the budget 2017 presented by Minister of Finance to Parliament and opined that the Budget was a forward measure if not for the proposals by which he had attempted to acquire the legitimate functions of the Central Bank (available at: http://www.ft.lk/article/580074/Budget-2017--Significant-improvement-if-not-marred-by-policy-inconsistencies-and-interference-with-the-Monetary-Board). “The Budget 2017 has also sought to encroach into the functions of the Monetary Board of the Central Bank of Sri Lanka by proposing certain proposals coming within the purview of the Monetary Board. This is against the objective of creating the Monetary Board and the Central Bank by Parliament in 1949. That objective was to allow an independent Monetary Board to manage the country’s monetary and financial systems, free from intervention of politicians or outside parties. These two functions are too precious to be left to the politicians who have personal agendas. Hence, the Monetary Law Act MLA made provisions to safeguard the position of Monetary Board members; once appointed by the President on the recommendation of the Minister of Finance and in consultation with the Constitutional Council, they cannot be removed while they hold office at the whims and fancies of the Minister of Finance. If he desires to do so, there is a specific procedure stipulated in MLA. All these functions had been assigned to the Central Bank by Parliament by enacting special legislations and it was emphasised that the Minister should not seek to take them away from the Central Bank without going back to Parliament. The third article published in December 2016 under the title ‘ Reform the Central Bank but don’t erode its independence’ cautioned the Government that the way the Minister had proposed to reform the Bank would result in eroding its independence, an objective which the Prime Minister too had outlined previously when he presented his first economic policy statement a year ago (available at: http://www.ft.lk/article/586305/Reform-the-Central-Bank--but-don-t-erode-its-independence ). But the Minister or the Government does not appear to have taken these warnings seriously. Hence, it is up to civil society now, as had been voiced by CCC in the press statement quoted above, to come forward to defend the Central Bank. The Monetary Board or the Governor alone cannot do that job without such support. Governor Coomaraswamy cannot be faulted for expressing his professional views on the economy candidly and frankly. The Government led by Prime Minister Ranil Wickremesinghe will benefit immensely if it has the patience and wisdom to listen to this professional.